It's not been just a "quilty" week, I've been knitting also. I'm behind on my "52 Quilts in 52 Weeks" schedule, so I sort of hope it doesn't warm up enough this weekend that I want to work in the yard! I do have one quilt finish to share, #13 for 2013. This is the December ""Fat Quarter Fun" project from Ruth's Stitchery. I had it all finished and ready to take to class for Bring and Brag, when I realized one of the outside nine-patches was in the wrong place. Thanks, Barb, for your fast un-sewing so I could fix it in class! 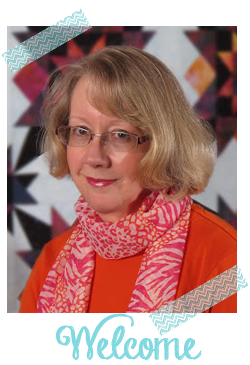 The pattern is "Nine to Five" by Mary Ellen Hopkins. I used two Timeless Treasures fabrics, one from the "Library" collection -- it looks like the endpapers in old books. The other is a brown "blender" fabric, and the background is a brown polka dot from Robin Pandolph. At first, I was disappointed that there wasn't more contrast between the two brown fabrics. However, looking at the photo, I think it's OK. I hadn't made a quilt with a pieced border like this before, but I will look for more patterns with this feature. Although laying out the quilt on the design wall was a bit of a challenge, it looks neat when it's finished. This one doesn't have a home yet, but I think I will quilt it and send it to Idaho to donate to the nursing home for a lap quilt. 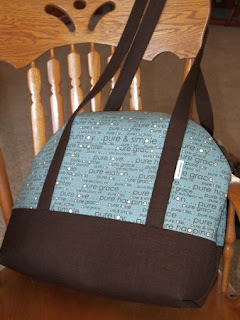 I realize I have never shared the most recent Sew Sweetness bag I test-sewed for Sara Lawson. The Aeroplane Bag is a big bag, large enough to hold all needed for a weekend trip to Ohio for high school graduation. If you notice that the red peeking out from beneath the blue and brown bag is my sewing machine carrier, you can imagine how large this bag really is! 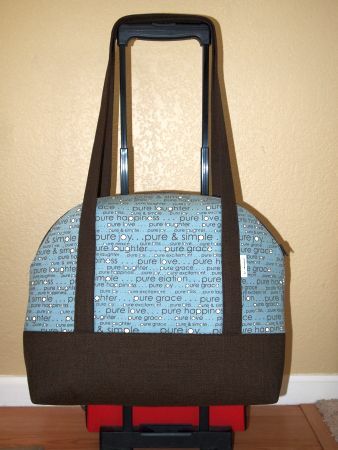 I used Sweetwater's "Pure" deco weight for the blue, and brown upholstery fabric for the brown. This bag has a long zipper across the top and two of Sara's signature zipper pockets inside. I confess this was not the easiest of her bags I've sewn, but it is totally worth the work! Here is a link to Sara's post showing all the Aeroplane bags test-sewn. And here is a link to all of Sara's patterns. I really enjoyed testing Sara's patterns! You may have heard that we had a little Spring blizzard here in Colorado this week. We didn't get enough snow to make it worth the trouble, but boy howdy, we had wind! Because my sewing machine sits in front of a window and the wind really whistled around that corner, I hunkered down in front of the TiVo and knit hats while watching "Monarch of the Glen" on Netflix. 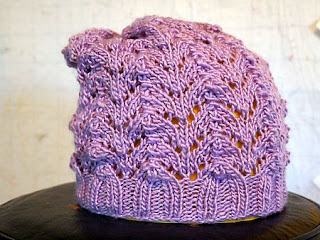 Hat #1 is the "Fishtail Lace Slouch Hat." It's a free pattern from the Cascade Yarns blog, available here. An easy knit, the lace pattern is quick to memorize. I made mine from Louisa Harding "Grace" silk and wool blend. 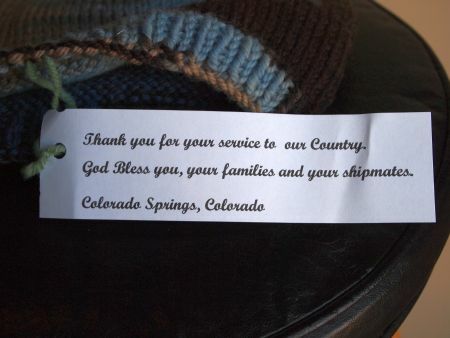 It's not machine washable, so it can't go to Hats for Sailors. But as Mama said "the right person for every (hat) will come along." This one is for Hats for Sailors, thought. It's the Christine Knitted Slouchy Tam Hat, designed by the Dishcloth Diva herself, Deb Buckingham. I test knit this pattern for Deb last summer and it came out too short. She edited the pattern to increase the length of the hat and it turns out to be a very cute, slouchy hat. The yarn is Cascade 128 Superwash. See? Modeled by the adorable receptionist at European Wax Center, Amelia. Thanks, Amelia! I have some other things to add to the gift drawer. I started these "Irish Hiking Mittens" a couple of years ago and finally finished them. I had just enough yarn to make a sort-of short "Irish Hiking Beanie" to match. Sadly, I tossed the yarn ball band, so I don't know what yarn this is. Here is another not-for-Sailors hat, but made of yarn I couldn't resist! The pattern is the Malabrigo Head Thingie, the yarn is Crystal Palace Taos. 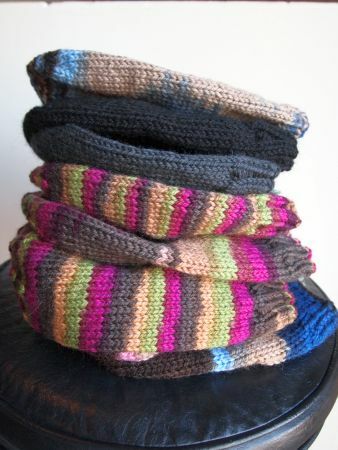 The last Hats for Sailors hat is Cascade 220 Superwash, but alas, I can't remember or find the pattern. I love this color, though, it's Lake Chelan Heather. 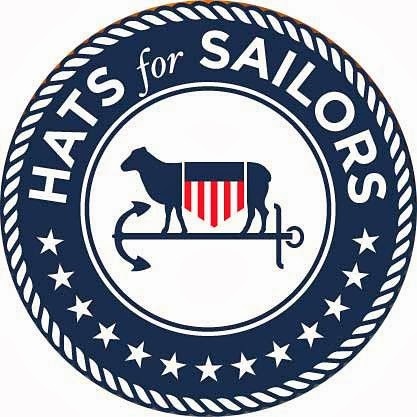 If you're a knitter and interested in Hats for Sailors, there are several free patterns and instructions for donating on their website here. Linking up to Thank Goodness it's Finally Finished Friday, hosted this week at Quilt Matters, and Richard and Tanya Quilts Link a Finish Friday #62. Just wait 'til you see what I have to share tomorrow on Saturday Stash! Wow you have had a very productive week. Wonderful hats, Marti! That bag is seriously awesome, too. Thanks for linking up to TGIFF! Those needles have been clicking away!! Love the brown quilt - love the "frame" around it too. Ooo - I really like this quilt top. And the hats are marvelous! Boy - it sure is gloomy out there today, eh? Perfect for staying in with quilt work. :D Too bad I'm just on a tax-work break right now. . .
You really have been busy. Love the hats and that bag looks amazing. It might almost be big enough for my daughter who adores really big bags. The quilt is adorable. wow your making me feel lazy over here...... Very nice job. I love the beanies! Amelia is my daughters name. Such a pretty name, and not too common amongst us adults. We're just coming into some cold windy weather so I'm hoping to hunker down and get sewing.